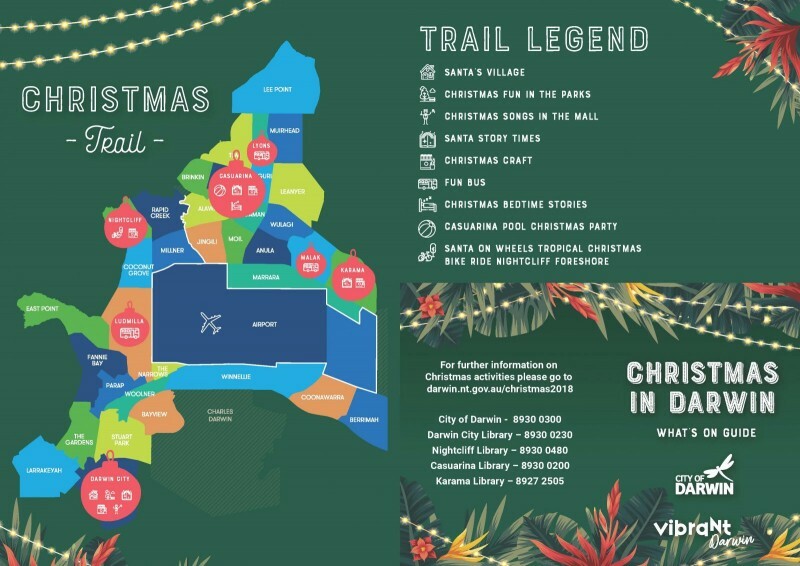 Get into the festive spirit and join our Christmas trail filled with exciting activities for all ages at many City of Darwin locations around town. 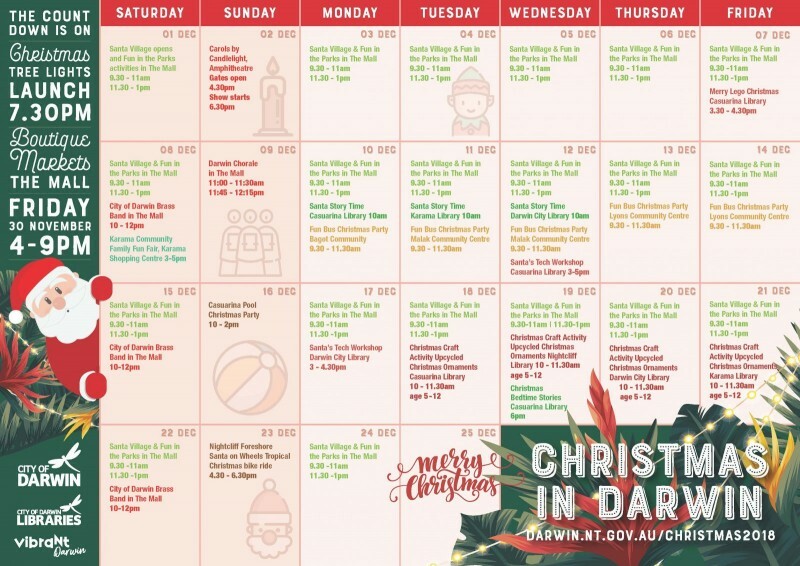 It's beginning to look a lot like Christmas here in Darwin, and this year we've put together a Christmas Trail filled with super fun activities. There is loads going on across Darwin suburbs, find out what's in your area via the map below or download your copy. Santa will be in his village between 1st - 24th December (closed Sundays) from 9.30 – 11am and 11.30 – 1pm along with our fun in the parks team with craft activities. Face Painting, balloon artist and a photo booth will also be in attendance to celebrate the opening. The Christmas in Darwin Association is proud to present the 44th Annual Carols by Candlelight Darwin and continuing raising funds for children in need - the 2018 recipients are the Down Syndrome NT and Alawa Scouts. Christmas is just around the corner! It’s time to gather the kids and head to carols for a night of festive cheer, lighting a candle and sing along. Hosts this year are Ali & Greg from Mix 104.9 and the Australian Army Band performing with many other well-known acts getting everyone in to the festive spirit. Finishing off the night with a massive fireworks display that could blow Rudolph's antlers off. Gates open at 4:30pm and is gold coin entry. Food and refreshments are available to purchase from the Kiwanis Club. This is a family friendly event so we ask that you please leave your smokes and alcohol at home. Come along to hear Darwin City Brass band perform a variety of Christmas carols and songs in the Mall. Join City of Darwin Alderman at the annual Karama Family fun fair to be held in Karama Shopping Centre. Jumping Castle, animals from Territory Wildlife Park, face painting, photo booth, School Choirs singing Christmas songs and so much more. Karama Library will be open for the event, get creative at the craft table, see a 3D printer in action, explore new worlds with virtual reality, play with different robots. Plus enjoy heaps of other activities. Join City of Darwin Aldermen at a very Aussie Christmas pool party with free sausage sizzle, cake, plenty of water wonderland games including inflatable water slides, inflatable obstacle course, face painting, photo booth, animals form Territory Wildlife Park will all be part of the fun. Free entry to Casuarina Pool all day. Not a child was stirring and their eyes were all starry. The Christmas stories were told with joy and a song. Wear your pyjamas and bring your teddy along. Join Santa for the City of Darwin Santa on Wheels Tropical Christmas Bike Ride! This FREE, all ages event will kick off at 4.30pm at the Foreshore Cafe. At 4.45pm, riders will form a merry procession along with Nightcliff Foreshore through to Rapid Creek Bridge, finishing at Nightcliff Pool. At the end of the ride, participants can enjoy a refreshing swim and a range of fun activities, including a jumping castle and photo booth! Participants are encouraged to don themselves AND their bikes with as much tropical Christmas bling, trinkets and cheer as they can muster...prizes will be on offer for those who impress our judges! If you would like to join in the merry procession, register for the City of Darwin 'Santa on Wheels' Tropical Christmas Bike Ride and receive a goodie bag on the day! Please ensure you bring a helmet along for the ride. Santa and his reindeers are coming to the Library for Story Time.